As noted in our advertising principles, we’re constantly looking to improve the quality and security of our advertising platforms. After identifying a technical issue with reach estimation for Custom Audiences that could potentially allow misuse of the functionality, we’re temporarily removing the ability to see audience sizes or potential reach estimates for newly created or edited Custom Audiences in Ads Manager and Power Editor, followed by the Ads API. Website or mobile app Custom Audiences that do not include customer data and engagement Custom Audiences are unaffected by this update. 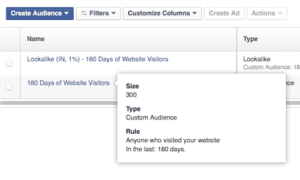 Now Every custom audience created on Facebook will be representing the numbers as -1. 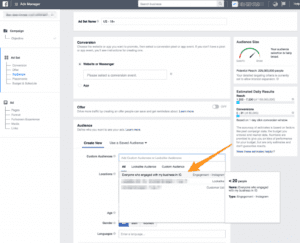 Facebook custom audience size -1 error will be resolved soon by Facebook. Please note that you will still be able to create Custom Audiences, as well as ads using any type of Custom Audiences, on our platform. Ads delivery and reporting will remain unaffected by this change. Additionally, access to all other data in Facebook Analytics will remain unaffected by this change. We understand this solution may affect your campaign planning. To minimize disruption, we are currently investigating solutions to restore these reach estimates in our interfaces. Q: Are these estimates going away forever? No. This is a temporary solution; we will look to implement additional changes to our system and relaunch estimates for new or edited Custom Audiences, but this functionality will be unavailable for the near future. Q. How will this impact reach and frequency? Advertisers will still be able to use reach and frequency and will be able to see a potential reach for their audience but will not receive the % Target Audience number when booking campaigns that use these Facebook Custom Audiences. Q. Will this impact existing campaigns (active and inactive)? No, this update does not impact delivery so new or existing campaigns will run per usual. While reach estimates will not be available for certain types of new or edited Custom Audiences, you can still plan and run campaigns against these audiences. Q. How will this impact Audience Insights? For impacted Custom Audiences, Audience Insights data will not populate and where applicable, the interface will show “data is not available”. Update: This is a temporary bug, and it will be solved soon by Facebook.